Review by Cass Moriarty – 4 Jan 2019 – Read full review here. 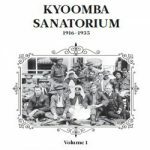 Author Deborah Wheeler has self-published two volumes of non-fiction research books on the Kyoomba Sanatorium. 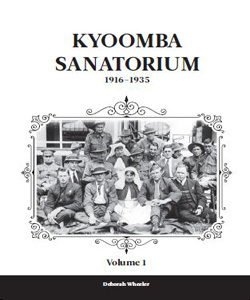 Beautifully-presented hardback editions, with a foreword by the Premier Annastacia Palaszczuk, together these two volumes offer a wealth of information about the Kyoomba Sanatorium which was located in Stanthorpe and utilised from 1916 to 1935 to treat returned soldiers recovering from tuberculosis and other lung diseases after World War I…. Both of the author’s grandfathers fought in World War I and this personal link has fanned Deb Wheeler’s curiosity about the Kyoomba Sanatorium. Before she began her research, very little was known about the facility, and she has strived to shine a light on this aspect of our ANZAC history. With the high altitude and cooler temperatures of the Granite Belt, many soldiers suffering from lung complaints were sent to Kyoomba from around Australia and New Zealand and even from Canada to recuperate…. These two volumes are a great addition to the body of knowledge surrounding the ANZAC soldiers and their treatment after the war and would be of interest to anyone researching World War I history, or to those who have a personal connection to someone from that era.